If you're after the very best media streaming TV box to complete your home cinema setup in 2019 we're here to help – you've got a ton of options to pick through these days, but this guide will cut through the jargon and explain the key differences between the best media streamers. They all do the basics – the basics being getting Netflix or whatever else up on your big screen – but there are some variations in features and capabilities that you should know about before parting with your cash. Read on to find out what the best TV box is for you. The best media streamer for your neighbour's home cinema setup may not be the best dongle for your particular setup, so proceed with caution. You need to consider the content you want to watch, on which channels, and decide on the devices you're going to be using with your new hardware to pick the best TV box – an iPhone works much better with an Apple TV than an Android flagship does, for instance. That extends to movie and TV show libraries too: where is all your money invested – Netflix? iTunes movies? Movies on Google Play? You can't get all of these films on all of these media streamers, so this can help you narrow down your choices. The Roku Streaming Stick+ will get 4K, HDR video up on your screen for not much money at all – and it's notable for not being linked to Google, Amazon or Apple, so it shows no bias towards particular apps. The only content you can't play is anything bought from iTunes. If you can live without that, the Roku is an excellent choice: a huge number of apps, including the usual suspects and some more unusual ones (like Firefox), a smooth and clean menu, effortless setup, and the familiar remote. It's the best option for most people. The Chromecast Ultra is slightly different in that you need another device – like a phone or a laptop – to make it work. It's compatible with a host of apps across Android and iOS, so you should be able to get most of your audio and video content up on the big screen. As usual, that excludes iTunes, so movies and TV shows from iTunes are out, but pretty much everything else is in, making this one of the best media streamers around. If you don't want to spend quite so much money, try the cheaper 1080p Chromecast instead. We love the Amazon Fire TV Stick 4K, despite its faults (no Google apps, including YouTube) – and if you're a Prime subscriber with access to Amazon Prime Video then it's definitely worth getting this as your next media streamer. There's even Alexa voice control thrown in. 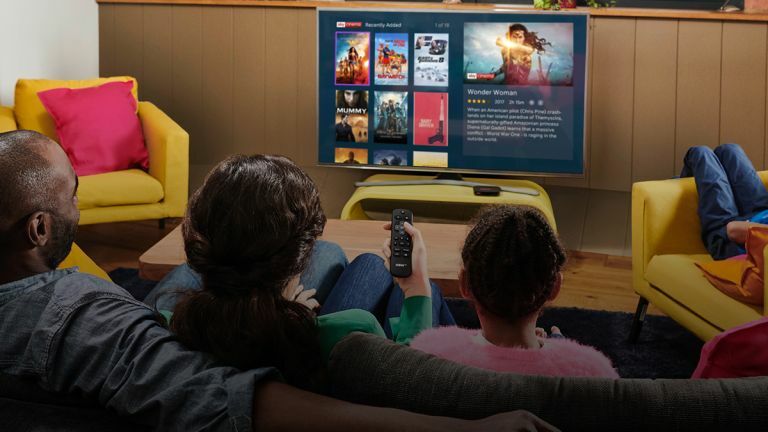 As the name suggests, the stick can handle 4K and HDR with aplomb, and Amazon's interface is a breeze to use If you're after an actual box for your best TV box then the Amazon Fire TV Cube is worth a look, though it's only out in the US at the moment. Any discussion of the best TV box has to involve a mention of the Apple TV 4K, which offers Dolby Atmos sound support as well as 4K HDR visuals (app depending). It's fast, versatile, and better kitted out with components than most of the media streamers you'll find. On the other hand, it doesn't much like playing nicely with other devices that aren't made by Apple, and it does cost quite a bit too, so it's a little lower in our list. This is the only TV box that'll play iTunes movies and TV shows up on your living room TV set, by the way. The Nvidia Shield is like the Apple TV for Android lovers: expensive, but packed with power and features, and undoubtedly one of the best media streamers. Android TV has all the big apps on it, except for iTunes and Apple Music, and comes with Google Assistant now too. Another reason to get the Nvidia Shield TV is for the added gaming features: options to stream gameplay from a local networked PC or even the cloud. You can of course play a good chunk of the games available on Android too, and a gamepad accessory is available. The Now TV devices are adapted from Roku hardware, which means they offer the same sort of ease-of-use and wide app selection. In particular, they're great for getting Sky Sports or Sky Cinema on your TV, without committing to a full Sky Q subscription. As far as the best TV box goes we slightly prefer the Now TV Smart Box to the Now TV Smart Stick, because you get 4K content in apps that support it. If you buy some Sky programming at the same time as the box, you can get a discount on the overall price.